Summary: This walk is to the prominent tops on the south west of the Howgill Fells. Access to the fells is from Low Haygarth where there is easy roadside parking. 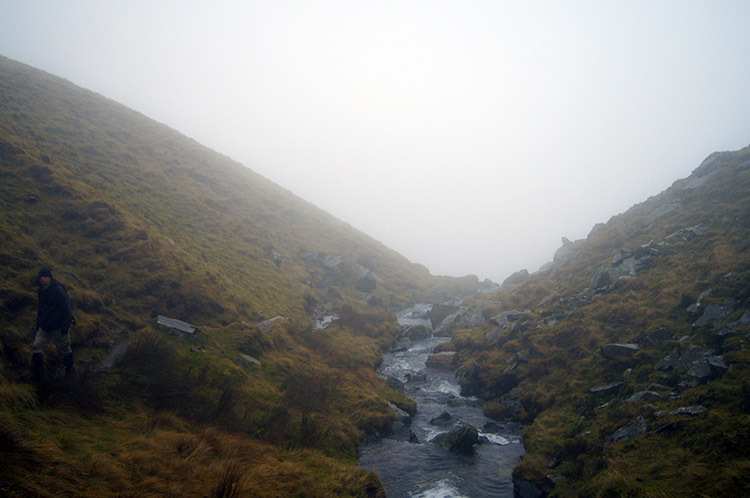 The approach is dramatic following Cautley Holme Beck upstream to a steep ascent beside Cautley Spout waterfall up to the rolling slopes above Cautley Crag. 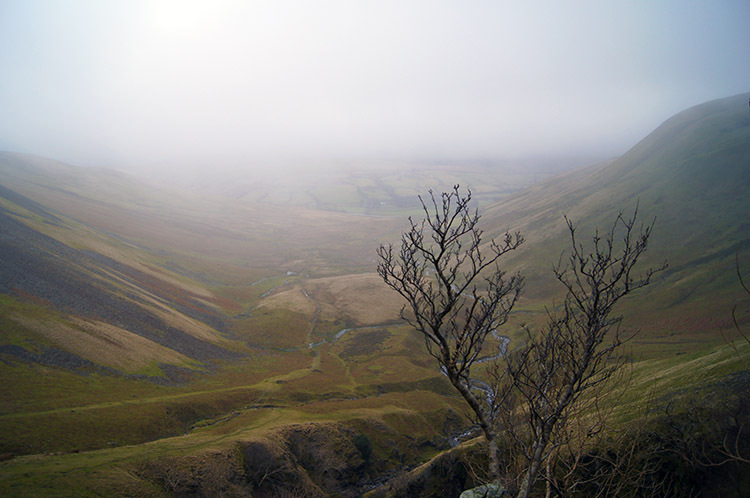 Once on top there are a succession of Yorkshire's 2,000 foot mountains to visit. In order they are Great Dummacks, Calders, Bram Rigg Top and the Calf which is the highest point of the Howgill Fells. 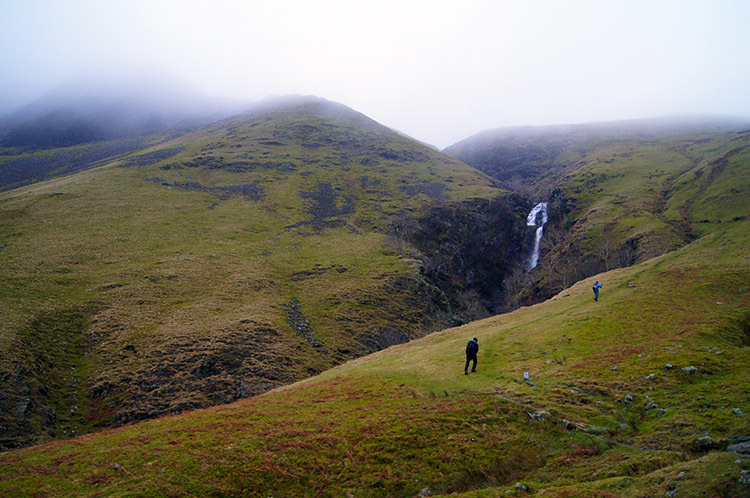 After the Calf is visited the walk concludes by returning to Cautley Spout down besides Swere Gill and then from Cautley Spout back along Cautley Holme Beck to Low Haygarth. 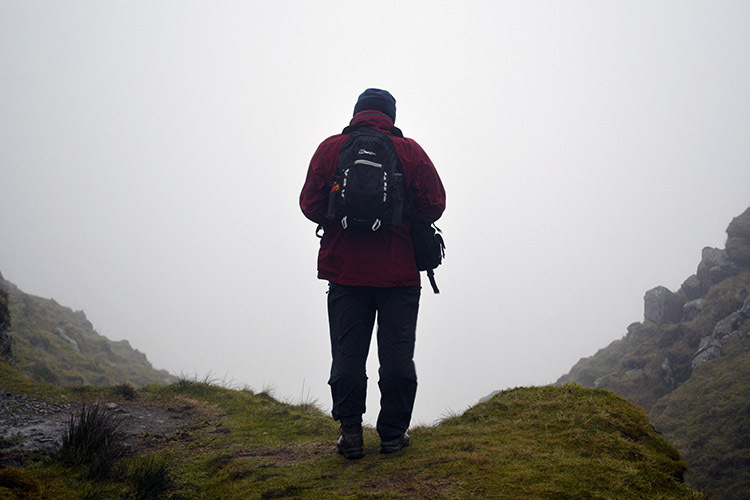 The Walk: I try to plan walks when the weather forecast is at least half decent, especially when walking with friends and having to drive appreciable distances. This walk was planned as the first walk of 2013 and we were given a promising forecast of early morning rain and low cloud clearing as the morning progressed. So as I travelled with my walking party the 70 miles from Harrogate to Low Haygarth we hoped for Met Office accuracy. The plan was to cover as many of the Howgill Fells prominent tops as we could. All five Yorkshire 2,000's on the range were certainly in the plan. We arrived at Low Haygarth by mid-morning. Although it had rained during the drive it was not raining as we set off on the walk. I was in the company of regular walking friends, my brother Dave, John Lister and also Peter from Harrogate who joined us for a day out in his quest to walk as many new mountain ranges as possible. 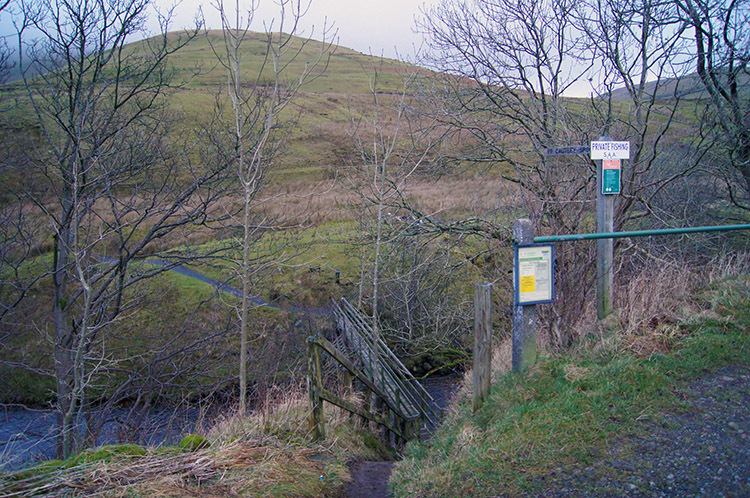 After we had crossed the footbridge over the River Rawthey at Low Haygarth we followed the easy path following Cautley Holme Beck upstream towards the Howgill Fells range. This approach to the Howgill Fells is spectacular and my favourite as the sight of Cautley Spout waterfall draws me enthusiastically towards it. The walk, through the valley towards the high ground is just sublime. We repeatedly questioned the accuracy of the weather forecast as we neared Cautley Spout Tongue and as we gained height ever more steeply by drawing close to the right hand side of the waterfall we feared the worse. No views on top, cloud clinging on all day, no rolling hills to look out over or sleeping elephants as Alfred Wainwright famously called the Howgill Fells. Still, not giving up hope too soon we laboured on up the steep flank of Cautley Spout and sometimes taking short breaks for gasps of air while viewing the valley below. We we working off Christmas and New Year indulgence. The hike up was tough, it always is, even more so working off all that food and drink. Despite the dank conditions the walk was enjoyable. 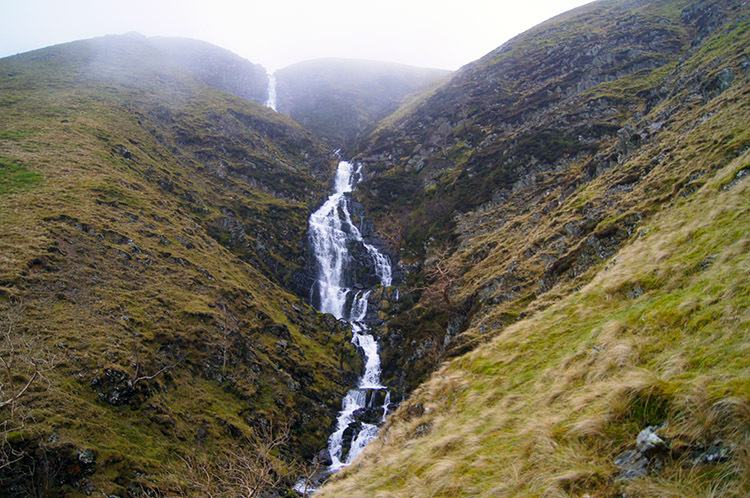 I always revel when near Cautley Spout, it being one of my special places. I was first introduced to the Howgill Fells in the 1990's and having seen Wainwright's elephants for the first time I have always wanted to return time and time again. Fortunately in the past I had always been blessed with the views. This time I would have to acquaint myself with the immediate ground around my feet! Not to worry, once Cautley Spout's steep bit was done and dusted we could take a short breather by Swere Gill before exploring pastures new. Pasture's new indeed for on all my previous incursions into and to the top of the Howgill Fells I had never visited some of the Calf's satellite tops. I had always made a beeline straight for it, whether it be from Low Haygarth or from the town of Sedbergh. 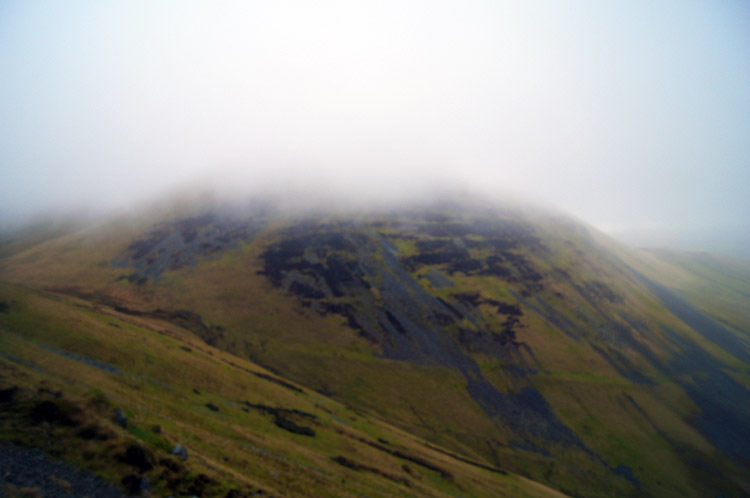 To walk on the crest above Cautley Crag was something new and despite the clinging cloud it was enjoyable. I could just make out the precarious drop over the crag to the east as we walked along its top line. The cloud made the scene eerie and ominous. The walk along the top of Cautley Crag took us to Great Dummacks, the first named peak on the walk. Little more than a grassy top we reached and passed over the summit in an instant by making a right angled turn to the right and continuing to follow a bearing to Little Dummacks and Calders. The GPS confirmed we had attained all the desired summits but we could not see much beyond our feet. 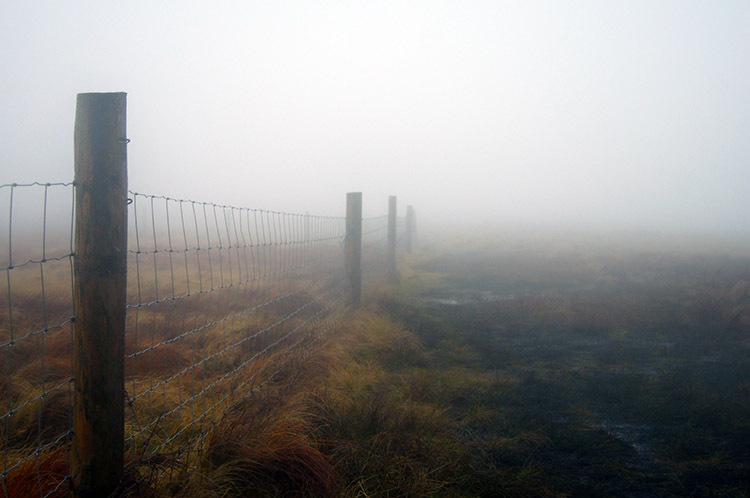 Then on the hike to Bram Rigg Top we reached a point of reference, almost walking into a fence! Only at the last moment did we see it, almost stumbling into to it, so thick was the cloud. After reaching Bram Rigg Top, a similar indistinct raised lump of turf to the others we continued on without stopping. Perhaps I am a little harsh on the peaks. They may have fine views from each of them, but on this walk there was precious little to see. So, continuing on to the Calf we reached it and after the fence our second and more permanent point of reference. 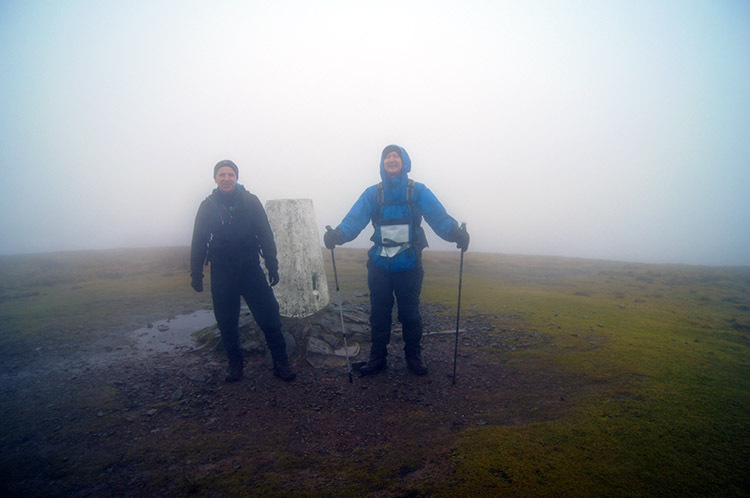 The trig point on the highest point of the Howgill Fells confirmed we were there. After a quick photo shoot at the summit we made the decision to curtail our planned walk to Yarlside and get off the mountain. 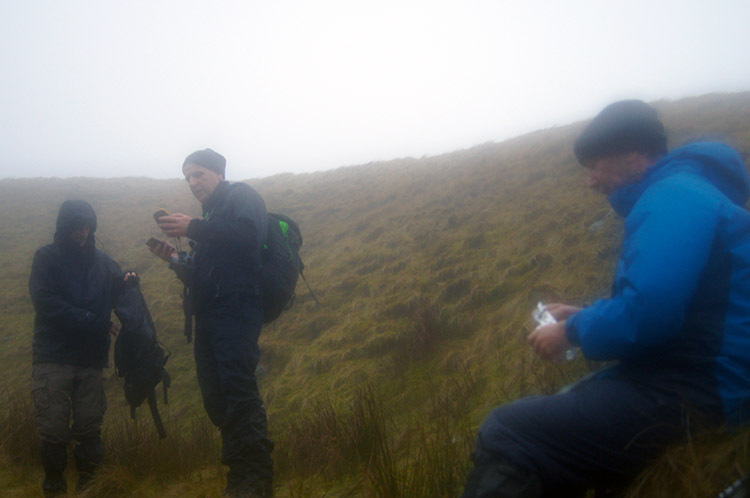 The cloud had made conditions very cold and oppressive on the tops and we had suffered enough. As soon as the decision was unanimously agreed we hastened our pace back down into the protective cover of Swere Gill. Out of the chill a little we stopped for a refreshment break. Not one of us had wanted to give in on the original plan but we all agreed there was no point descending from the Calf to Bowderdale and then back up into the cloud to Yarlside. Leave it for another day was the decision. After the refreshment break, which we did not linger on, we continued following Swere Gill down towards the point where it abrupt joins Red Gill Beck to plummet down Cautley Spout. 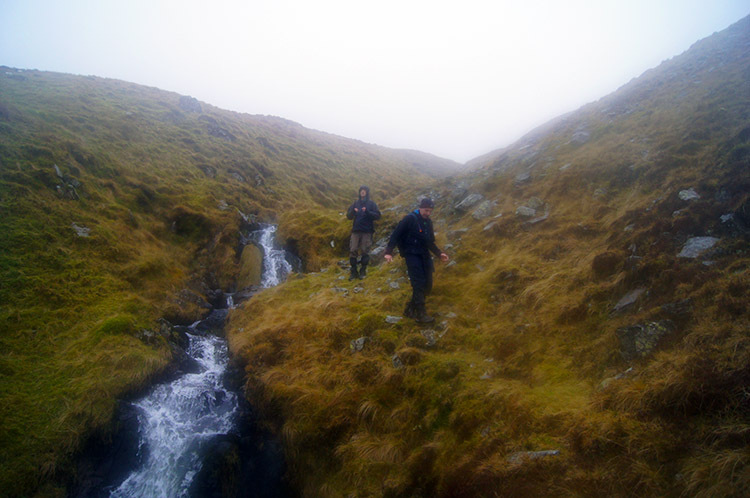 The descent down Swere Gill is actually quite good fun, scampering from one side of the beck to the other regularly. That is until the brakes are used where the becks meet and a short traverse to the path down the side of Cautley Spout is regained. On the photograph top right I am checking out that precise point. And so, path from Swere Gill to Cautley Spout Tongue regained we headed back down the path, carefully on the steep bits for it was slippery going on the steps. 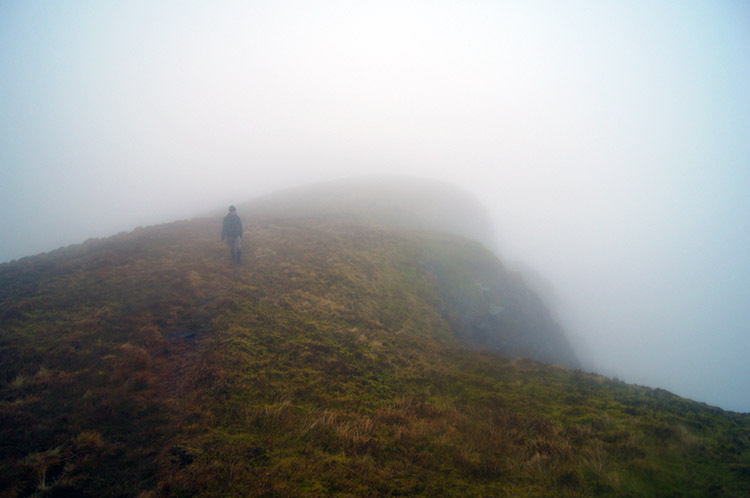 As we descended I looked over to Yarlside and seeing its top half still covered in thick cloud I knew our decision to curtail and descend was the right one. From Cautley Spout Tongue we walked back to the car, drove to Austwick, had a short walk around Norber Erratics and then went to the pub. A good day. Despite our lack of fortune with the weather the walk was a good day out and we actually had a good deal of fun. 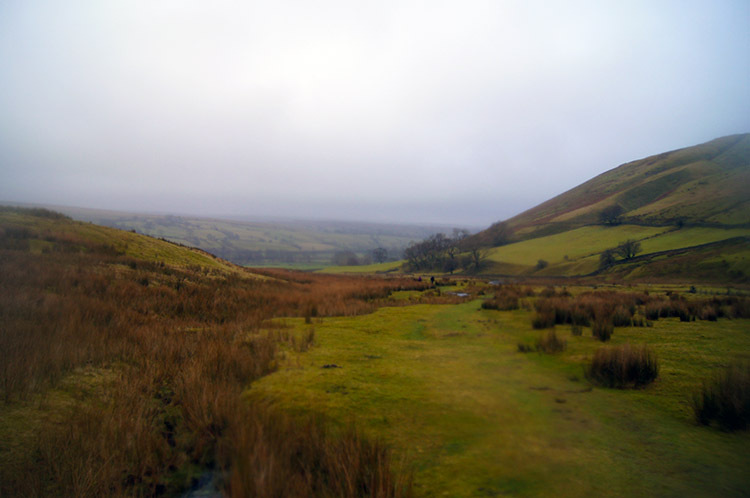 The walk itself would be a perfect introduction to the Howgill Fells. From experience I can guarantee if the conditions are right the views from the tops are tremendous. 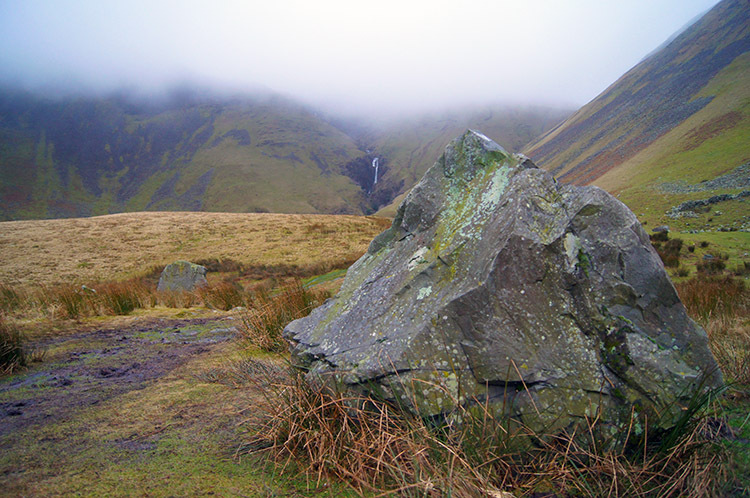 And as stated in the report, the walk to Cautley Spout Tongue from Low Haygarth and the following ascent of Cautley Spout is just excellent. Whatever the weather.